Shortly after the gifts of bread and wine are brought to the holy altar during the Great Entrance of the Divine Liturgy, the priest exhorts us: "Let us love one another so that we may be of one mind in confessing." We respond by singing: "The Father, the Son and the Holy Spirit, the Trinity one in being and undivided." This is a moment of great importance in the Liturgy and in our lives since these words express the very nature of the Church. In a common love and by a common love the Church proclaims its faith in the ultimate community of love: the Holy Trinity. The Church itself is a community of love, as well as a community of faith. Those who refuse to love others cannot worthily confess the love of the Holy Trinity in the Creed. We cannot say: "We believe in Love," if at the same moment we do not include in that divine love every man and woman created in the image of God. St. Paul, then Saul of Tarsus, was on his way to Damascus to kill those who believed in Christ. He wanted to destroy the community there. On his way he was blinded by a radiant light and thrown from his horse. A voice asked: "Why do you persecute Me?...I am Jesus whom you persecute" (Acts 9: 4,5). In this way St. Paul experienced at first hand the absolute identification Christ has made with His Church. Jesus spoke in the same manner during His earthly life. Describing the last judgment, He tells us that people who admittedly never knew Him are saved because of the love they showed Him ~ "as often as you did it for one of My least brothers, you did it for Me" (Mt 25: 40). St. Paul came to believe in Christ and devoted his entire life to spreading the Good News and building up Christian communities. He came to see this unity between Christ and His Church as something most profound. St. Paul repeatedly described the Church in terms of a human body, a living organism, to show the essential unity between Christ and His Church, as well as the organic link among the members: "The body is one and has many members, but all the members, many though they are, are one body; and so it is with Christ. It was in one Spirit that all of us, whether Jew or Greek, slave or free, were baptized into one body" (1 Cor 12: 12-13). St. Paul says this unity is so intimate because it is a union with Christ and the Holy Spirit who can never be divided. Our immersion in the waters of baptism and our anointing with holy chrism achieve a union with God deeper than any earthly relationship. We can never be worthy of such a gift or achieve this for ourselves. It is a free and generous gift of our loving God who "brought us to life with Christ when we were dead in sin. With and in Christ Jesus He raised us up and gave us a place in the heavens . . ." (Eph 2: 5,6). All our actions, as individuals and as faith communities, help or hinder the impact the Gospel of Christ has on our world. United to Christ, all our thoughts, words and deeds can be transformed by the Holy Spirit into a sacred offering pleasing to the Father. Joined to Christ we offer our service, humble as it may be, to God, so that like Mary, the Mother of God, we can bring forth the Body of Christ. God is calling us, as He did Mary, to allow God to have His Word done in our work. United to Christ, God's creative power uses our gifts and talents to transfigure this world into the Kingdom of God. What can we add to Christ? How can we complete His work? One aspect of the Church as Christ's body, asks us to remember that Christ's physical body was limited in His earthly life as is ours. During Christ's lifetime He visited a limited number of places and interacted with a limited number of people within a given time period. Now He is extended throughout the world in His Body, the Church. Another aspect of which we need to remain aware is that the same Holy Spirit that filled Christ, now fills the Church. The limitless depth of holiness, of divine life, of love, is now enlivening Christ's body the Church. The Church, which draws its strength from this Treasury of blessings, is thus the fullness of Christ. The "Orans" icon is one of the most beautiful depictions of the Mother of God. 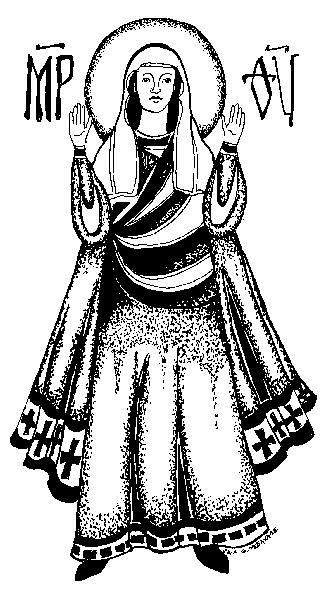 This icon shows Mary praying with her arms outstretched in total and complete surrender to God. Red, the royal color of Mary symbolizes the divine Body of Christ, the Church. She prays for all her sons and daughters because she is the Mother of the Church as well as the Mother of Christ. We do not pray alone during the Liturgy. We pray together with all the saints: "Remembering our most holy and immaculate, most blessed and glorious Lady, the Mother of God and ever-virgin Mary, together with all the saints, let us commend ourselves and one another and our whole life to Christ our God." This remembrance of the Mother of God and the saints leads us to a deeper commitment "to Christ our God." Having been inspired by those in the family of God who have rendered such perfect service to His excellent glory, we will begin each day by outstretching our arms and offering ourselves in total surrender and commitment to Christ, our God. Grandma told about the time that Grandpa came home to find her deeply distressed. Grandma said the new pastor had called earlier that day. "What did he say?" asked Grandpa. He asked: "Does Christ live here?" And I didn't know what to say. Grandpa looked up. "Did you tell him we are respectable people?" He asked. "He didn't ask that, Grandpa, He asked if Christ lived here?" "I might have said that, only that isn't what he asked me." Grandpa grew a little annoyed. 'Why," he continued, "didn't you tell him we are always in church?" Grandma broke down and started to cry. "He didn't ask that either. He only asked, Does Christ live here?'" How would we answer the question if the pastor called on us? Each time we enter the church and see the icon of Our Lady of the Sign with Christ in her bosom, the Mother of God asks the same question: "The Christ Who lived in me, does He live in you?" The Lord is close to the brokenhearted; and those who are crushed in spirit He saves" (Psalm 34:19). Like a tree that is fertilized by its own broken branches, God uses our brokenness for our growth. Just as God took broken soil and produced a plentiful crop, broken clouds to provide rain, and crushed grain to produce tasty bread, so He takes our brokenness and produces saints. Consider all the broken people Jesus meets during His earthly life: Peter, Mary Magdalene, Thomas, the woman at the well, etc. Jesus accepts these persons, broken by sin, and makes them into vessels to be used for God's greater glory. The Lord is never as near to us as when we are broken and crushed. He takes the broken things of our lives and makes them into better things for His divine purposes. Saint Anthony said: "I offered Christ a broken heart; He took it and gave me a new and beautiful life." In peace, let us pray that God will accept our brokenness and make us into more beautiful, more saintly, more humble, more understanding, more sensitive, more open to God's grace. Scripture scholars tells us that there are striking similarities between the Joseph of the Old Testament, the one with the multicolored coat, and the Joseph of the New Testament, the one betrothed to a virgin named Mary. Each of them responds to God's grace by dreaming dreams and traveling to Egypt. Out of Egypt the first time comes Moses and the Ten Commandments. Out of Egypt the second time comes Jesus Christ and the commandments of love. Or, as we hear in St. John's Gospel: "For while the law was given through Moses, this enduring love came through Jesus Christ" (Jn 1: 17). We know precious little of the Joseph, betrothed to Mary. He was of the house and lineage of David. The Gospel of Matthew begins with a listing of some of the earthly forebearers of Christ, St. Joseph among them. These were the persons who helped make the coming of Christ possible. Who are the persons who have made the coming of Christ a possibility in our own lives ~ our parents, grandparents, godparents, relatives, co-workers, teachers, friends? In a sense we can all be a part of the genealogy of Christ when we make His coming into our world possible by our word and example. Joseph is in touch with his inner world. St. Matthew describes him as "an upright man." God spoke to him in dreams and he possessed the wisdom to discern the truth. The truth that Mary conceived the Son of God in the power of the Holy Spirit will never be fully understood. 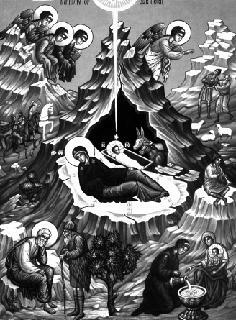 In the icon of the Nativity we see Joseph lost in his contemplation being tempted by the devil to disbelief and pondering "how can this be?" And how can it be that the Prince of Peace is born into a world in which He is almost immediately harassed by violence because of Herod's fear that Christ would be king instead of him? St. Joseph is a wonderful model of faith for all of us. Faith is trusting in God when we don't understand; when no explanation is possible or enough. Faith often means that we must sit and ponder. And like Joseph, we will also be tempted to disbelief that God is with us. Only in God's grace will we find the courage, the hope and the love we will need to follow our dreams, to be faithful to God's plan for us. May St. Joseph, model of faith, guide us.